Got a TI-99/4A for free and recently obtained what I believe to be the rest of the hardware I need to power it up and connect it to my TV, but I don't see anything on my TV. 1. Like the commodore 64, I don't need a cartridge to access some sort of prompt? 2. My TV is 100+ pound SDTV and I have one of those TV/Game switches (so I can play my Atari) and I popped what you see in the image below into where the cable TV came in. 3. I noticed the "PROTECTION" light never came on. 4. I don't believe I need the other piece of hardware that you see to the left unless I want to keep the computer hooked up full time and need to run my cable TV service through this device? Am I missing something simple here? I have tried several combination of channel 3 and 4. The red light on the system itself did come on when powering up the machine. Thanks for helping the TI-99/4A newbie. You are correct in stating that you have all the necessary hardware and software to operate your TI. You should be able to see the blue "Texas Instruments" splash when everything is hooked-up correctly and turned on. If the red light on the console comes on there is a pretty good chance that it is a working console. My only assumption is what you mentioned: there must be an issue with the RF modulator. The red protection light should come on when everything is connected and turned on. Do you have a different TV you can try it on? I have had some issues in the past with certain TI RF mods not operating correctly on certain TV's (in most cases the screen would come up, but it would be black n white instead of color). Edited by Mad Hatter, Tue Aug 17, 2010 11:59 PM. Thanks all. I saw that eBay auction and was going to ask about that next. Sounds like a huge win in terms of ease of use and the last thing I need is that bulky RF modulator. Now on to joysticks. What are the best recommendations? Where can I get them? Is the speech synthesizer worth anything? Any other recommended hardware? The TI-99/4A is a great gaming platform! There are a ton of killer games for it (TI Invaders, Munchman, Super Demon Attack, Moon Mine, Parsec, Donkey Kong, Q*Bert, Popeye... just to name a few). They can usually be had for $15-$20. If you would like to try and build one yourself just click here or here. I recommend the Atari adapter also; it gives you many more options for controllers, almost all of which are better than TI's sticks. 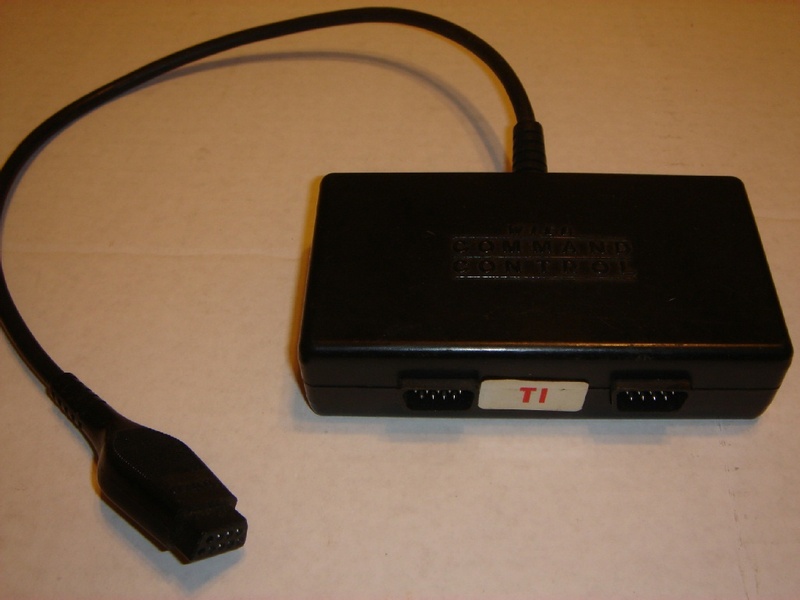 The one thing you have to look out for with the Atari adapter is that, because the original TI joystick port doesn't include any power pins, the Atari adapter can't provide extra power to the controllers. One consequence of that is that Atari trackballs will not work with the adapter, even in "joystick mode" (ordinary Atari joysticks will be fine). This is also why Wico's TI trackball included its own AC adapter. The speech synthesizer can usually be found fairly cheaply, and it adds speech to popular TI games like Parsec and Alpiner. Tex*In Treasures (a TI vendor I'd recommend highly) carries them used for $15. I realize I'm late here, but I have bought that video cable from that Ebay seller before and it works fine and seems to be of good quality. And I would really like one of those Atari controller adapters, I'm content with the TI "Wired Remote Controllers" for now. They're not SO bad. I'd say the Atari controller adapters appear quite often on ebay. So they shouldn't be hard to find. FYI: There's currently a gamepad in development for the TI-99/4A. The gamepad will not require the atari adapter. That will be very cool; also for the new games currently in development. That gamepad looks really good! I have been getting into TI gaming a little this year, after having one for years without using it... Anyway, a controller like that might be nice to try sometime.